HX4 Analog Telephone Adapters (ATA) series offers high quality low-density access devices used in residential, SOHO and mobile office VoIP applications. It provides reliable, low-cost, and flexible means to deploy converged communication solutions for network operators and enterprises. 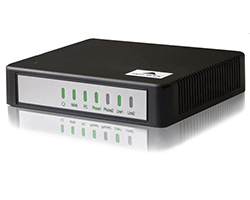 HX4 series can be configured as either 2-in-1 with connections to Ethernet and analog phones, or 3-in-1 with connections to Ethernet, analog phones and CO lines. Consisting of 3 models, HX4 series is a desktop and wall mountable. The highly compact hardware with a ARM9 400M CPU supports the Linux kernel and the application software which inherits from the New Rock famous MX gateway design, delivering stable performance, high interoperability and compatibility, and rich features. HX4 series is a cost-effective entry-level VoIP device with the capability and quality seen in expensive VoIP equipments.